We’d love your help. Let us know what’s wrong with this preview of Elsie Mae Has Something to Say by Nancy J. Cavanaugh. So she writes a let Elsie Mae is determined to save her beloved Okefenokee Swamp, but is she willing to accept the unexpected? So she writes a letter directly to President Franklin Roosevelt himself and sets off to enjoy what may be her last happy summer there with her new dog, Huck. But when she arrives, she discovers a team of hog bandits who have been stealing from the swamper families. To ask other readers questions about Elsie Mae Has Something to Say, please sign up. This is an adorable, 7-11 kids read. It's got dogs, bandits, a swamp, boats, simple politics and a loving Grandma and Grandpa in it. Very perfect for little girls or boys. I would recommend it as a read to them story, in case they have questions, but it's mostly fun with a good morale at the end. It is however, due to the setting at the Okefenokee Swamp and the 'swamp people' lifestyle, filled with a fair bit of religion. Interestingly however the lead gal isn't convinced by God at first; but wi This is an adorable, 7-11 kids read. It's got dogs, bandits, a swamp, boats, simple politics and a loving Grandma and Grandpa in it. Very perfect for little girls or boys. I would recommend it as a read to them story, in case they have questions, but it's mostly fun with a good morale at the end. It is however, due to the setting at the Okefenokee Swamp and the 'swamp people' lifestyle, filled with a fair bit of religion. Interestingly however the lead gal isn't convinced by God at first; but without a doubt she is quite convinced of God in the end. It's not a bad thing; just something to be aware of if that sort of thing bugs you. I think Nancy J. Cavanaugh really captured the spirit and joy of our lead gal, Elsie Mae. As the youngest of seven it's very obvious that Elsie Mae adores her summers (alone) with Grandma and Grandpa because she is the star. I think many youngest siblings could find a real connection with Elsie Mae and her want to be a hero to the swamp residents. Alternatively the little boy we meet is a quieter, preachers kid who is clearly troubled by many things. I felt for Henry because he clearly felt unwanted through most of the book. Certainly an emotion I remember as a child and I'm sure most kids have felt this way at some point. There are some tougher topics in Elsie Mae Has Something to Say; from abandonment, prison, adults who don't measure up and some dangerous choices the kids make; I feel there is a lot of content here that would engage kids to ask their parents questions. If you read to your little one you might want to read this through first to be prepared for some of those questions. In particular I didn't like how the kids doing something dangerous resulted in them being rewarded just because it turned out okay. What if it hadn't? This is the one theme I had trouble with and why I can't quite give it 5 stars. Overall this adorable little (partially true) story about saving the Okefenokee swamp is worth the quick read if you're intrigued as an adult or teen. And certainly in my top 5 for age 7-11 good books picks for 2017. Thanks to SOURCEBOOKS Jabberwocky and NetGalley for an advanced copy in exchange for an honest review. "Elsie Mae Has Something to Say" is about a little girl who spends her summers at her grandparents house who live on a swamp that is in the process of being sold to a shipping company. Elsie Mae takes it upon herself to write a letter to the President to save her family home. This book was really enjoyable. I really liked the two main characters especially Henry James; he was adorab 3.5 rating. Elsie Mae loves spending summers with her grandparents at the Okefenokee Swamp. She's a city girl from a large family and here she has complete freedom and she can be herself. Because hardly anyone notices Elsie Mae at home she wants to do something brave, she'd like to be a hero for once. When the swamp is in trouble, because someone wants to destroy it for financial gain she writes a letter to the president, hoping this will make a difference for both the swampers and herself. Is it enough for Elsie Mae loves spending summers with her grandparents at the Okefenokee Swamp. She's a city girl from a large family and here she has complete freedom and she can be herself. Because hardly anyone notices Elsie Mae at home she wants to do something brave, she'd like to be a hero for once. When the swamp is in trouble, because someone wants to destroy it for financial gain she writes a letter to the president, hoping this will make a difference for both the swampers and herself. Is it enough for others to notice Elsie Mae though? Henry James has been left by his parents and Elsie Mae isn't happy she won't have her grandparents' undivided attention for the summer after all. He wants to be a preacher and keeps quoting the Bible. Elsie Mae is still looking for a moment of glory and when hog thieves are stealing people's livelihoods she wants to be the one to catch them. Together with Henry James she goes after the criminals. Will Elsie Mae become a hero like she planned and if she does, is being a hero what she wanted or is it tougher than she thought it would be? Elsie Mae Has Something to Say is a beautiful story. Elsie Mae is a strong, smart and brave girl. Together with Henry James she has many fantastic adventures. Most of them are pretty risky and I loved the tension Nancy J. Cavanaugh has put into her story. Elsie Mae and Henry James come to an understanding before getting to know each other well, I liked that approach of friendship a lot. They both enjoy good food and they love animals, but Henry James is a devout person and Elsie Mae is after being noticed. This is a fabulous combination that leads to many fantastic scenes and plenty of amazing dialogue. I really enjoyed their story and couldn't wait to find out if they'd catch the hog thieves and if the president actually read Elsie Mae's letter. This was such a good book! I loved it so much! It has a really good lesson, about changing your ways, and not being selfish/prideful, caring for and loving others, and many many others/more. I really loved this book and I definitely recommend it to everyone-it's for all ages! I definitely enjoyed the summer in the Okefenokee swamp with young Elsie Mae and her grandparents, also her friend, a preacher's son, who aids and abets her as she tries to catch pig-stealers. A smart tracking dog is a big help too. In the background, a letter the girl has sent to President Roosevelt relates to the fact that a shipping - canal firm wants to drain the swamp and lumber firms aim to cut down trees. What good can an eleven-year-old be against such vested interests? Read, enjoy and le I definitely enjoyed the summer in the Okefenokee swamp with young Elsie Mae and her grandparents, also her friend, a preacher's son, who aids and abets her as she tries to catch pig-stealers. A smart tracking dog is a big help too. In the background, a letter the girl has sent to President Roosevelt relates to the fact that a shipping - canal firm wants to drain the swamp and lumber firms aim to cut down trees. What good can an eleven-year-old be against such vested interests? Read, enjoy and learn a lot. Also laugh. Twelve-year-old Elsie Mae lives for the summers she spends with her grandparents who live in the Okefenokee Swamp. When she learns of plans for new shipping canal that will upset the ecosystem of the swamp, Essie takes it upon herself to write to President Roosevelt. Sure he has a lot to think about what with the Depression but if he reads Essie's letter and saves the swap, Essie would sure be grateful. She'd be thrilled to have her picture in the paper and become famous for something other than Twelve-year-old Elsie Mae lives for the summers she spends with her grandparents who live in the Okefenokee Swamp. When she learns of plans for new shipping canal that will upset the ecosystem of the swamp, Essie takes it upon herself to write to President Roosevelt. Sure he has a lot to think about what with the Depression but if he reads Essie's letter and saves the swap, Essie would sure be grateful. She'd be thrilled to have her picture in the paper and become famous for something other than her clumsiness and being the youngest of a large family. The summer of 1933 Essie spends at the Okefenokee Swamp will change her life. First, she adopts a dog, something she's been dying to do forever and then she discovers the neighbors' pigs are being stolen by bandits. Essie figures she can solve the case herself, but before she can get started, her cousin Henry James, a preacher's kid, comes to visit. Henry wants to be a preacher like his Daddy and can't reign in his "hallelujahs" and takes up a lot of Grandpa's attention and love. How can Essie solve the mystery of the pig bandits if Henry James won't stop following her and won't shut up? She'll find a way, especially with a special dog by her side. I really really wanted to like this novel. I don't mind plucky, tomboy heroine writes to President Roosevelt and saves the day stories. I love special dogs like Huck, who is hands down my favorite character in the novel. I do not like bratty children who deliberately disobey their elders, get into danger AND are rewarded! Much of this book reads like a Tom Sawyer story for girls. The episodic plot had too much disobedience and the lesson comes very late in the story and I didn't think it was much of a lesson because the things that happened just happened due to human nature and not something Essie did. Her revelation about being "saved" was just too much to swallow too. Essie Mae annoyed me so much. She is bratty, a bully towards her cousin, lies, disobeys rules that are there for her own safety and ends up constantly rewarded for her bad behavior. She does love Huck and is very attached to him. I love Huck too! He is a special dog. I figured that out pretty quickly but I didn't expect the plot twist that seemed a bit far fetched. Sweet, loving, mischievous Huck is the best character in the novel. I wanted to throw my arms around him and hug him just like Essie. FYI to Elsie's grandma- if you give the dog a nice cozy place to sleep and some food he will be less able and inclined to pull down your laundry and eat your leftover pie. I was shocked no one thought to feed this scrawny creature! Is he supposed to run around the swamp and fend for himself when there are gators and pig bandits around? I should hope not. Huck doesn't deserve Essie Mae though. He'd be better off with Henry who truly needs a friend. If Henry were my cousin I would be annoyed with him all the time too. His preaching is really much too much. I get that it's important to that time and place but the author could have toned it down a little and skipped the practice baptism scene. Once the reason why Henry is left behind becomes known I felt even sorrier for him. I did guess that it was something like that. Essie Mae's mother sounds tough from Essie's point-of-view but that child needs something to do or she'll get into trouble! Essie's grandparents are lovely people who obviously adore her but they spoil her rotten. Her Uncle Owen is the same way. I liked his kindness and good humor but related better to cranky Uncle Lorne for most of the book. Uncle Lorne sees how his parents favor his brother and his niece and doesn't buy into that. I don't agree with some of the decisions he made and he ends up coming across as a major jerk to his family but sometimes I kind of liked him. The villains are pretty cardboard and transparent. That was rather disappointing. Loved the title and the cover and the message. The story was great. I wish Gramma had been given more of a life than being a good cook. I’m sure she had other hobbies and the ladies at the frolic asked her how long she kneaded her biscuits? with all that was going on I’m sure they had other things to discuss. But I realize the children were the focus. I’m not a good judge of children’s literature so maybe I need dunked in the swamp. "Now that I had experience being a hero, as good as it felt, it didn't seem all that important to be one anymore." I am amazed at this book. First of all, the theme and the moral of this book is my favorite thing here. It's mostly about being yourself and fitting in, in a world that pushes you to do otherwise. It's about finding yourself, finding a place (or a person) to call home, hope and friendship. The plot may not be for me but I have to commend it because it is very unique, which also makes it very intriguing. It would be a very good read for middle grade readers, and as well as for people who are looking for a young, easy, unique read. The character depth and the character development are uh-mai-zing. You can see just how Elsie Mae's view and perspective of everything changed from the very first page. This made reading the last few chapters a bit nostalgic feeling. I have to keep saying unique because that is what this is. It just really is so very unique. This book is something that I needed in my life right now and I definitely recommend to every teenager out there in the world who could possibly be reading this. Charming and heartwarming tale of standing up for what's right, being truly brave, and adapting to changes even when they throw you off course. Loved the 1923 swamp setting! Elsie Mae takes us on a journey into the swamp lands of the south. She and a pal, along with her new dog Huck, set off to solve the mystified the hog stealer. Another piece of historical fiction well done. I appreciate what Nancy Cavanaugh is exposing us to in Elsie Mae Has Something To Say. America is so rich in its diversity and people's that it's not until we read about it that we truly see its scope. Okefenoke Swamp, although still a National Wildlife Sanctuary as declared by President Roosevelt is a way of life that belongs to our past. Elsie Mae's story is wonderful for showing us what that life was like. Told in the jargon of the region we have a Another piece of historical fiction well done. I appreciate what Nancy Cavanaugh is exposing us to in Elsie Mae Has Something To Say. America is so rich in its diversity and people's that it's not until we read about it that we truly see its scope. Elsie Mae's story is wonderful for showing us what that life was like. Told in the jargon of the region we have a historical account of the 'swampers' that lived within. Elsie Mae shows us how important family and neighbors were and how they depended on the land for their livelihood. Her letter to President Roosevelt, she felt, would be crucial to help maintain this. Unfortunately Elsie Mae was not able to see the far reaching effects, how the Okefenoke Swamp would be changed forever. Yes, it has preserved the beauty of the Swamp by keeping out big companies who would choose to alter this area by stripping it of its trees; by building a canal through it and thereby altering the habitats of so many native animals and birds. Yet in doing so it has also changed the way of life known by those who lived there in the 1930s. 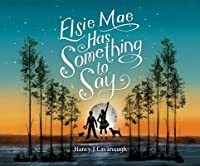 Elsie Maes' story which takes place during the summer is rich with unforgettable characters, from ornery Uncle Lone, her grandma and grandpa, a hound dog named Buck and Henry James who is determined to be a preacher when he grows up; and who better to practice on but Elsie Mae. The story is informative and has a good mystery. Are you able to find out who the hog-bandits are before the story ends? And yes, quite a few humorous moments. As Henry James would say: HALLELUJAH! If you see this book know that it is well worth the read. 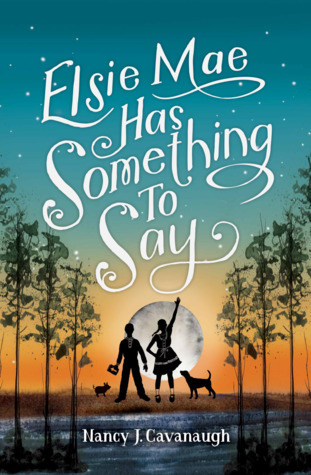 I received a complimentary copy of Elsie Mae Has Something To Say from SOURCEBOOKS Jabberwocky through NetGalley. Elsie Mae Has Something To Say is a book that touches the heart of all its readers. It is packed with adventure, family, love, friendship, and a little mystery. It reminds me of A Year Down Yonder and A Long Way From Chicago. This book will be a favorite of middle school readers because it is a story about a little girl in a setting that few middle schoolers have ever visited and are I received a complimentary copy of Elsie Mae Has Something To Say from SOURCEBOOKS Jabberwocky through NetGalley. This book will be a favorite of middle school readers because it is a story about a little girl in a setting that few middle schoolers have ever visited and are only exposed to it through television shows like Swamp People. The Okefenokee Swamp is filled with gators and quick sand, but it is also filled with Elsie Mae’s family, swamp traditions and culture. The swamp offers adventures that are only possible in its murky, still waters. Children will relate to the possibility of Okefenokee Swamp being destroyed for a shipping company to build a canal because they are bombarded with scenarios like this in today’s news. They will cheer for Elise Mae as she fights to save a place she loves and treasures. Elsie Mae is a heroine and proves even children can make a difference in the world. Readers will also fall in love with the characters. The perspective of Elsie Mae allows the reader to view the characters through the eyes of a young girl. All readers will be able to relate to Elsie Mae when she thinks that her summer will be ruined when cousin Henry James comes to stay in the swamp. Of course the adults love him because he is such a sweet Bible quoting want-to-be preacher, but Elsie Mae sees none of that. She only finds him annoying, as will the readers. Everyone has had a cousin Henry James! Huck, Grandma, Grandpa, Uncle Owen and Uncle Lone will also find very special places in the reader’s heart. This is a great historical fiction book that I think middle grade kids would enjoy. I really loved learning about the Okefenokee Swamp and the vivid and descriptive language that allowed me to be transported to that location. I took several breaks to research and explore more history about the swamp. The protagonist, Elsie Mae, is a firecracker who treasures the summers she gets to spend with her Grandparents at the Okefenokee Swamp in Georgia. This summer is a little different. There are hog ba This is a great historical fiction book that I think middle grade kids would enjoy. I really loved learning about the Okefenokee Swamp and the vivid and descriptive language that allowed me to be transported to that location. I took several breaks to research and explore more history about the swamp. This was a really wonderful story about Elsie Mae and Henry James. They became fast friends when they got stuck together for a summer and end up having a great adventure and a great time. I think that this story has all of the marks of a good story. Good characters, conflicting thoughts about things, and a clear moral to it. It is something that will teach people a lot and will also let them see something that would not be a part of their lives at all. This was a wonderful story and I really enjoy This was a really wonderful story about Elsie Mae and Henry James. They became fast friends when they got stuck together for a summer and end up having a great adventure and a great time. It is 1933 and Elsie Mae is hoping that what she has to say will make her a hero and bring her some notoriety. Everything she thinks and does is in that pursuit because she is sure that only then will she finally be noticed by her family. Elsie is a girl who loves and respects the Okefenokee Swamp, and her grandparents and uncles who call it home. The descriptions of life in The Swamp are pure magic and if you close your eyes you can see and hear the sounds and calls inherent in nature. She wants to save this magical place where she has spent the past six summers from the bulldozers which are threatening the way of life who inhabit the Swamp. While the book is definitely written for a young audience it should not be overlooked by adults. There are so many important messages and moral attributes that are seamlessly woven into the story. It was a fun, humorous and interesting read. Note: I received an eARC of this book from NetGalley in exchange for an honest review! This little book was absolutely phenomenal! Set in the 1930s, this book explores a place that we rarely see in kidlit, as well as a group of people we also rarely read about. For some folks the swamp was, and is, a way of life. It was wonderful to see that culture brought to life through Ellie Mae, who is spending the summer with her grandparents in the Okefenokee Swamp that straddles the Florida-Georgia line. Note: I received an eARC of this book from NetGalley in exchange for an honest review! This little book was absolutely phenomenal! Set in the 1930s, this book explores a place that we rarely see in kidlit, as well as a group of people we also rarely read about. For some folks the swamp was, and is, a way of life. It was wonderful to see that culture brought to life through Ellie Mae, who is spending the summer with her grandparents in the Okefenokee Swamp that straddles the Florida-Georgia line. It's a tale about a young girl who wants a dog and gets one, and who spends her summer dreaming of being a hero. Ultimately she gets her wish twice over, but in doing so she learns lessons about humility and selfishness. There are also wonderful lessons that are taught through her cousin, Henry James, and his traveling preacher parents. Not everything is what it seems at face value, and not everyone who claims to be doing good truly is doing good. Elsie Mae Has Something to Say shines a light on an interesting time and place in our country's history. Set in the Okefenokee Swamp in in early 1930s, protagonist Elsie Maw spends the summer there with her grandparents. Elsie wants to save the swamp, solve a mystery, and figure out how to deal with an unexpected guest. The story is really informative about a time & place not many people know about. I liked how the dialect sunk you into the swamper culture - a definite window book for lots o Elsie Mae Has Something to Say shines a light on an interesting time and place in our country's history. Set in the Okefenokee Swamp in in early 1930s, protagonist Elsie Maw spends the summer there with her grandparents. Elsie wants to save the swamp, solve a mystery, and figure out how to deal with an unexpected guest. Very quirky Southern. Now I'm curious-- did that many children really write letters to the president back in the 1930s and 40s? Must have, judging by the number of books in which this figures! I liked it, but I like historical fiction with unique stories, characters, and settings. Now my middle grade readers? Sadly they aren't always a huge fan of those type of books. It'll take the right reader for this book. Elsie is from a large family, so she is thrilled that she gets to spend every summer at her grandparents' home in the Okefenokee Swamp where she can explore, eat her grandma's great food, and have some space and attention of her own. There is talk that a canal might be built thro I liked it, but I like historical fiction with unique stories, characters, and settings. Now my middle grade readers? Sadly they aren't always a huge fan of those type of books. It'll take the right reader for this book. Elsie is from a large family, so she is thrilled that she gets to spend every summer at her grandparents' home in the Okefenokee Swamp where she can explore, eat her grandma's great food, and have some space and attention of her own. There is talk that a canal might be built through the swamp, so Elsie writes a letter to President FDR to persuade him to save the swamp. Her summer brings a couple new surprises as well as some adventures and small mystery-solving in the swamp. Nice, strong female character! I like Elsie Mae she's a real go-getter kind of girl. She sees a wrong and doesn't wait for others to fix it, she tackles it herself. And none of the clueless or uncaring folks at the bottom either- she goes straight to the top- The President of the US! grade school kids are going to be cheering this young lady on and maybe even being inspired to do something themselves. Good story! As the youngest of seven kids, Elsie Mae loves spending summers with her grandparents in Okenfenokee Swamp. She gets lots of time to herself and she loves the swamp. That is why she wrote a letter to President Roosevelt to save the swamp from a canal project. A big company wants to build a canal through Okenfenokee Swamp and destroy what makes it so special to the people who live there. This summer is a bit different from other summers on the swamp. The best thing is that Uncle Owen gets Elsie M As the youngest of seven kids, Elsie Mae loves spending summers with her grandparents in Okenfenokee Swamp. She gets lots of time to herself and she loves the swamp. That is why she wrote a letter to President Roosevelt to save the swamp from a canal project. A big company wants to build a canal through Okenfenokee Swamp and destroy what makes it so special to the people who live there. This summer is a bit different from other summers on the swamp. The best thing is that Uncle Owen gets Elsie Mae a dog of her very own. Huck doesn't make much noise but he is perfect in Elsie's eyes. The worst thing is that Elsie isn't the only kid staying for the summer. Her cousin Henry's parents are on a preaching circuit in Florida and sent Henry to stay in Okenfenokee for the summer. Henry wants to be a preacher just like his pa and spends most of the summer practicing. The other thing that makes the summer different is the hog bandits who are stealing people's hogs all over the swamp. Uncle Lorne wants to be the hero and capture the hog bandits, but it is really Elsie Mae and Henry who discover what is really going on. This is a quirky, Southern story. I love the swamp setting and all the information about the Okenfenokee Swamp. I thought Elsie Mae was a fantastic character with a lot of gumption and heart. This could be a bit of a depressing story what with Henry's parental abandonment and Uncle Lorne's behavior and Huck's ownership issues, but it wasn't. It was uplifting and heart-warming. It is a story about family and acceptance and finding your place. Full of quirky, wonderful, southern characters with a good plot set in 1940's when FDR is president. Excellent read. A fun book about pride going before a fall and learning to accept others…. Reminiscent of the vibe of Because of Winn-Dixie (but no dog). Southern, set in the 30’s, about family and the Okefenokee Swamp. A bit of mystery, a lot of humor, and a fair amount of information about the swamp. Have you ever wanted to have the best summer of your life and it doesn’t quite turn out the way you thought it would? Well, that is what happens to Elsie Mae, the main character in Elsie Mae Has Something to Say written by Nancy J. Cavanaugh. In this historical fiction novel written about life during the Depression, Elsie Mae was so excited that this summer she will again get to visit her grandparents at Okefenokee Swamp like she has for the past five years and explore nature. Elsie is devastate Have you ever wanted to have the best summer of your life and it doesn’t quite turn out the way you thought it would? Well, that is what happens to Elsie Mae, the main character in Elsie Mae Has Something to Say written by Nancy J. Cavanaugh. In this historical fiction novel written about life during the Depression, Elsie Mae was so excited that this summer she will again get to visit her grandparents at Okefenokee Swamp like she has for the past five years and explore nature. Elsie is devastated when she hears that a shipping company is planning to build a canal straight through the area she loves and so she decides to write a letter directly to President Franklin Roosevelt to save the swamp and be a hometown hero! She figures he is the best person to help her. Elsie Mae also wants to feel important. The novel was easy to follow as each chapter flowed into the next. Every character was developed clearly and the writing was so descriptive it was as if you could envision being there. Elsie Mae and her adventures were very enjoyable! I would definitely recommend this novel to young girls. Elsie Mae is a role model to girls of all ages because she demonstrates how girls should stand up and not be afraid to express themselves. Elsie Mae was a strong character who spoke up for what was right and wanted to prove that she was a supergirl!